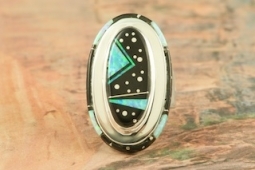 Stunning Sterling Silver Ring featuring Genuine Black Jade with Fire and Ice Lab Opal Accents. Designed by Navajo Artist Calvin Begay. Signed by the artist.